December in Las Vegas means holiday decorations and typically some good rates on rooms. Even though temperatures are still warm, the whole city has a festive feel, and you should make sure to see the holiday display at Bellagio as well as at the Palazzo. Or choose a unique restaurant in Las Vegas for a holiday meal or to have some cocktails to toast the end of the year. As December draws to a close, the crowds will grow and the excitement about the New Year fills the city. When you're planning your trip and what to pack, consider Las Vegas's weather and events to decide if December is right for you. December in Las Vegas does bring cooler weather, but it's nothing to get a meteorologist excited about. The holidays come to Las Vegas but the snow never really arrives. Oh, sure, there are instances when Las Vegas gets a flurry or two, but you can be sure that you will not need your heavy winter coat on the Las Vegas strip. December in Las Vegas means holiday decorations and the run-up to New Year's Eve so be prepared for festive decorations and holiday menus at the restaurants and bars. 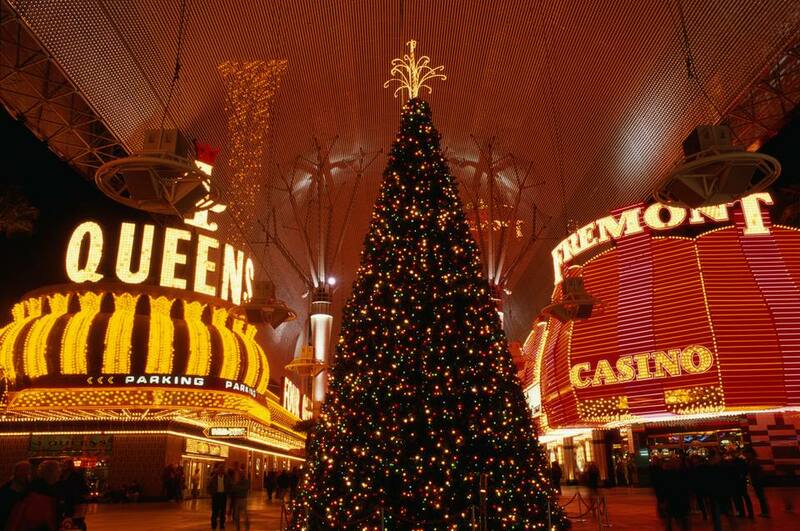 However, don't be surprised if your Christmas in Las Vegas is shrouded in the sunshine and 70-degree weather. Las Vegas averages only about .38 inches of rainfall in December, while averaging about 44 percent humidity for the month. All of the standard must-see Las Vegas fixtures apply in December, but the festive month offers a few extra special attractions, too. Lace up the ice skates and head to the Boulevard Pool at Cosmopolitan Resort. This strip-side rink has views of the Las Vegas and quiet corners to sit by the fire with someone special. The festive atmosphere transports you to your favorite ski lodge without the snow chains and extra layers of clothing. Ice-skating in Vegas is a must-do simply because it's December and you are in the middle of the desert! The Las Vegas Marathon is held in December to take advantage of the month's cooler temperatures. Start training early! If you find Vegas to be too warm, head to the T-Mobile Arena to watch the Vegas Golden Knights play hockey; the ice cools the place down, but the hockey heats it right back up. The holiday lights and Christmas tree at the Freemont Street Experience are a great way to get into the mood of the season. December is the perfect time to take a day trip to Mt. Charleston before the snow arrives or, once it starts to fall, ski and gamble on the same day! If you're planning on relaxing by the pool, we hate to be the bearer of bad news: Put away the swimsuit and grab a nice sweater for a leisurely cocktail poolside instead a December dip. However, there are a few heated swimming pools that are not crowded, and you might be able to work on your winter tan on the warmer days. As you plan your trip to Las Vegas, you can compare the prices of tours and attractions with Viator.com. If you're looking for shows, you can also try Best of Vegas, a ticket aggregator that offers discounts. Take a look at what they are offering, and if it suits you, you can easily save a few dollars. Want to know the best time to visit Las Vegas for you? Find out with our month-by-month guide to Sin City's weather and events. What is Las Vegas Like in September?